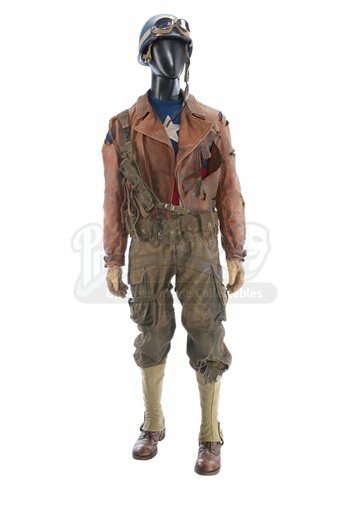 Captain America’s (Chris Evans) distressed Army rescue costume from Joe Johnston’s superhero film Captain America: The First Avenger. 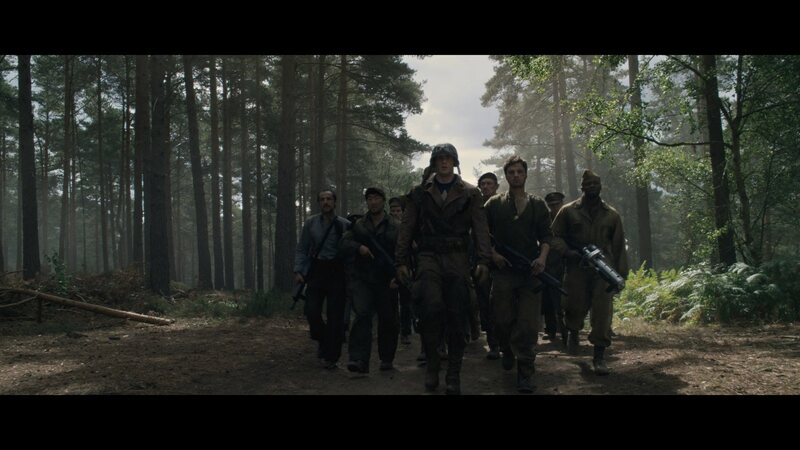 Steve Rogers wore his Captain America tour costume beneath Army fatigues when he infiltrated Johann Schmidt’s (Hugo Weaving) Hydra base in order to rescue his friend Bucky Barnes (Sebastian Stan) and other captured soldiers of the 107th. 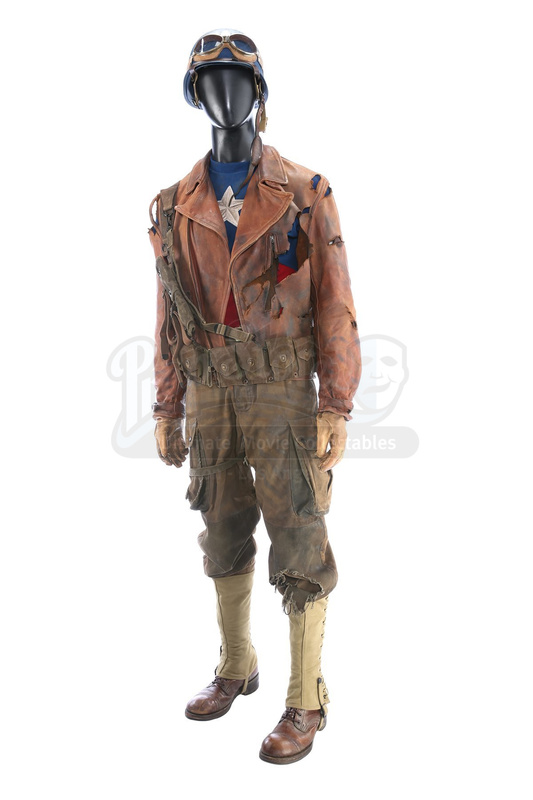 This costume is screen-matched to the scene in which Captain America returned to Colonel Phillips’ (Tommy Lee Jones) base of operations with the rescued soldiers. 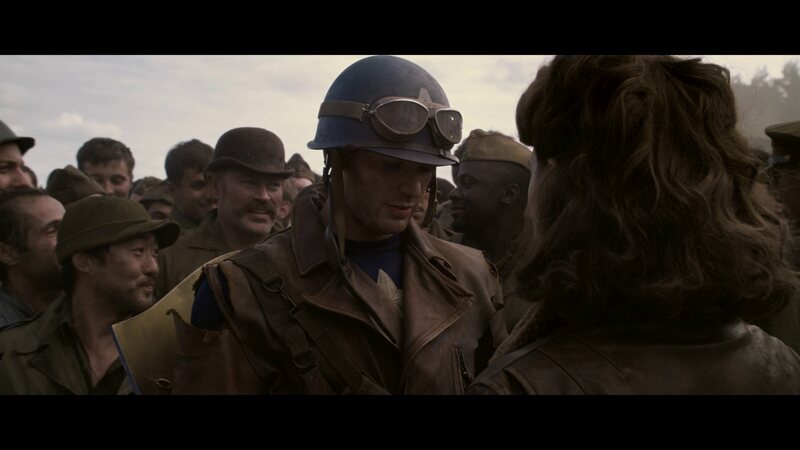 Captain America’s costume comprises a blue helmet, a pair of goggles, a leather jacket, webbing, an emblem tunic, a pair of paratrooper trousers, a belt, and a pair each of leather gloves, spats and leather boots. The blue helmet is outfitted with padding and straps for a snug fit, with a white stencilled “A” on the front. Inside the dome are four labels that read “STUNT”, “#2” and “STAGE 2”, and a printed barcode that also reads “FROSTBITE MARVEL 82021” (Frostbite being the production’s working title). The paratrooper goggles feature suede padding and wrap around the helmet with an elastic strap. 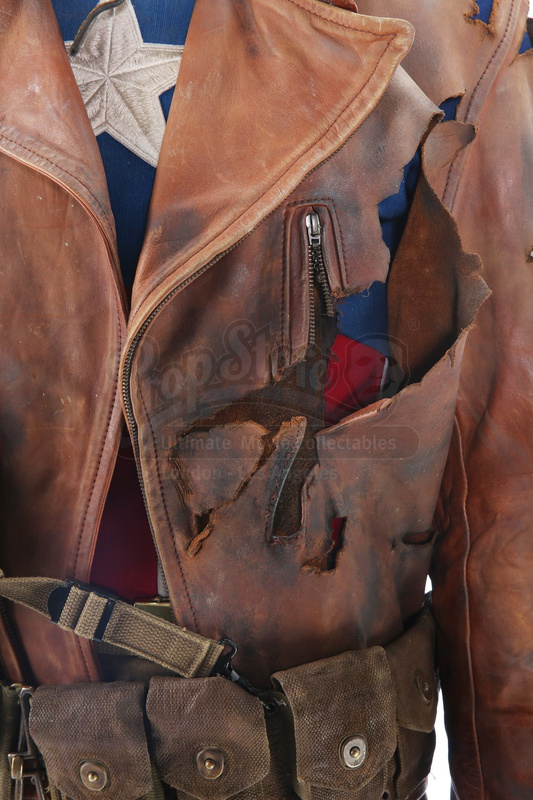 The brown leather jacket is thoroughly distressed by the production, with numerous tears on the sleeves and front panels. Inside the jacket lining is a barcode that reads “Marvel CAP 88979”. 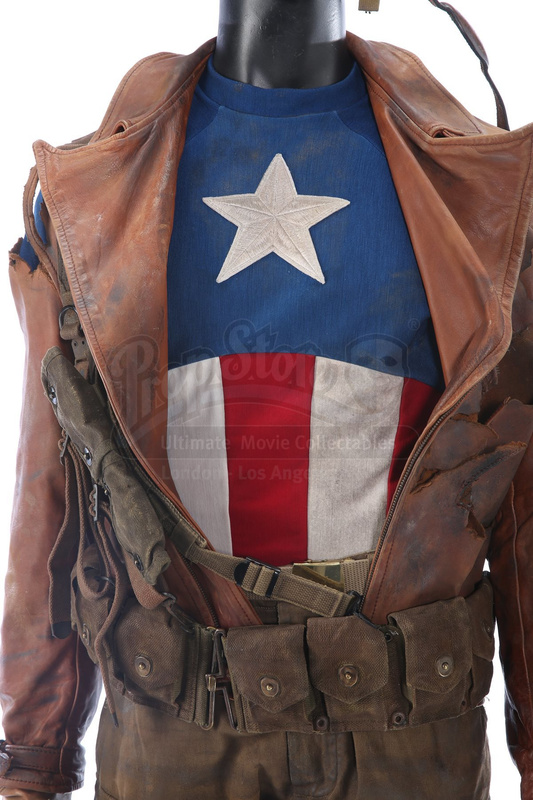 Worn under the jacket is Steve’s “Captain America” tunic from his vaudeville-inspired touring musical, which he wore while entertaining troops to boost their moral. 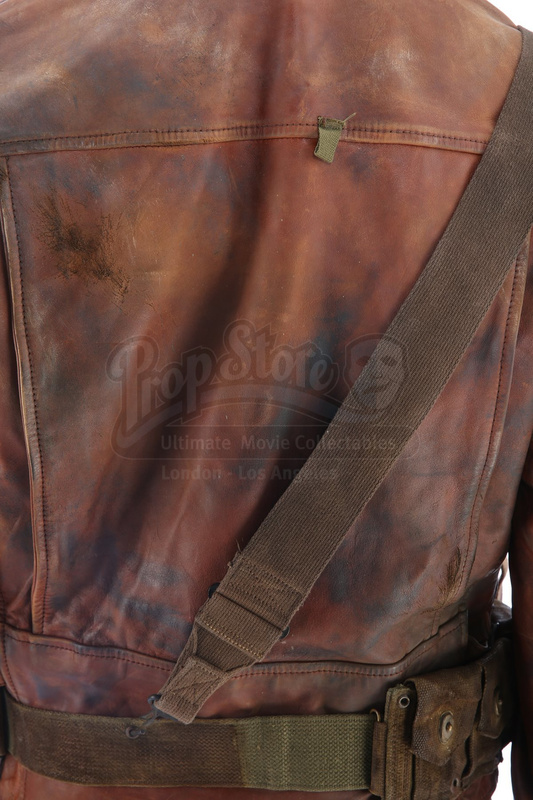 Stitched to the jacket is a green nylon webbing rig, which includes numerous pouches that are filled with foam. Fitting like a leotard, the tunic resembles the American flag and is made of spandex, with an embroidered white star over a blue chest with white sleeves and a red-and-white panelled abdomen. The back of the tunic mirrors the front and includes a hidden zipper. 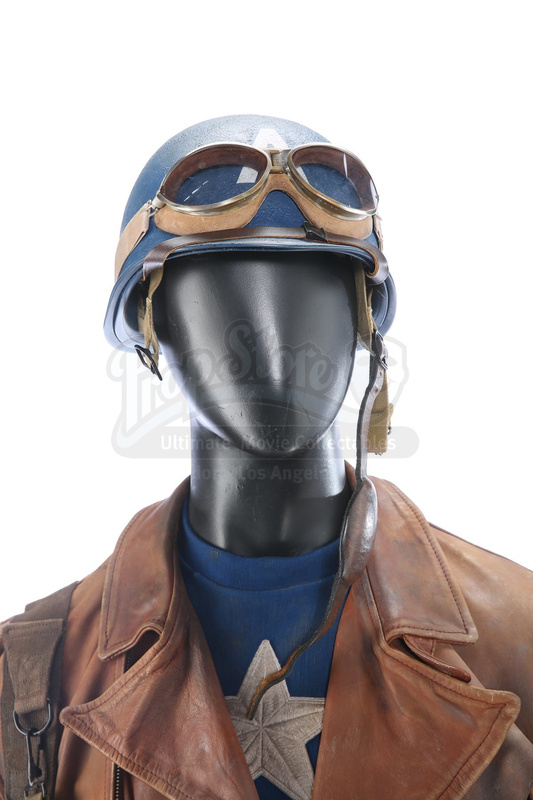 Inside the tunic is a handwritten label that reads “STEVE ROGERS SC 144”, and another “Marvel CAP 68441” barcode. 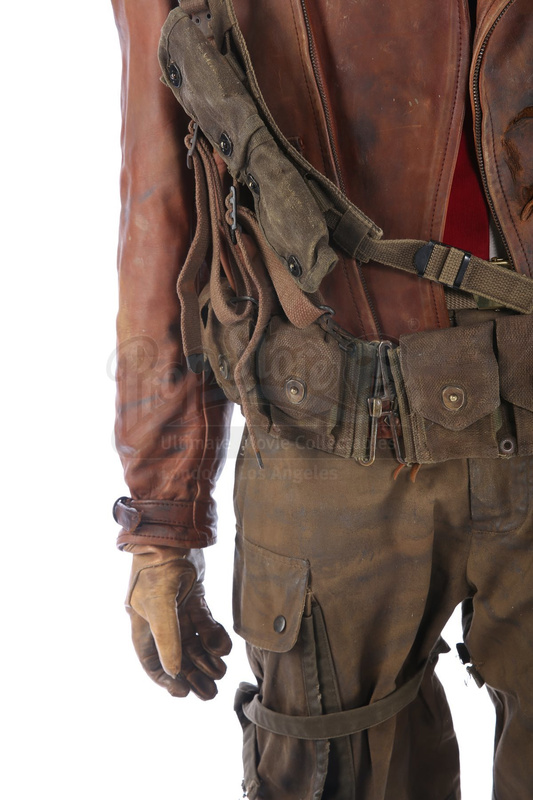 The paratrooper trousers are made of cotton and show distressing to the fabric, along with a large production-made hole below the left knee. The trousers include a nylon belt that features a Western Costume label. Also worn on the legs are spats, and a pair of leather boots. Inside the right boot is a barcode which reads “Marvel CAP 67549”. 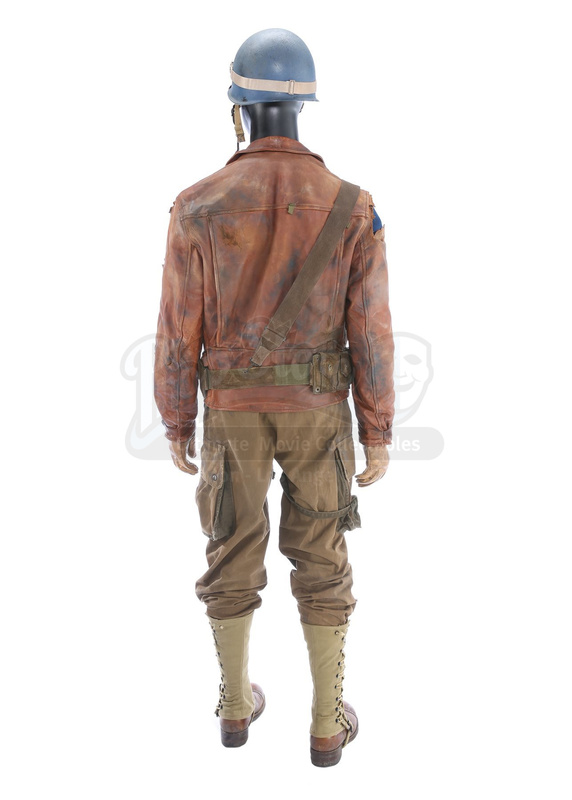 The costume exhibits intentional production distressing, while also showing some additional wear with a few cracks in the helmet, and is missing the zipper slider. 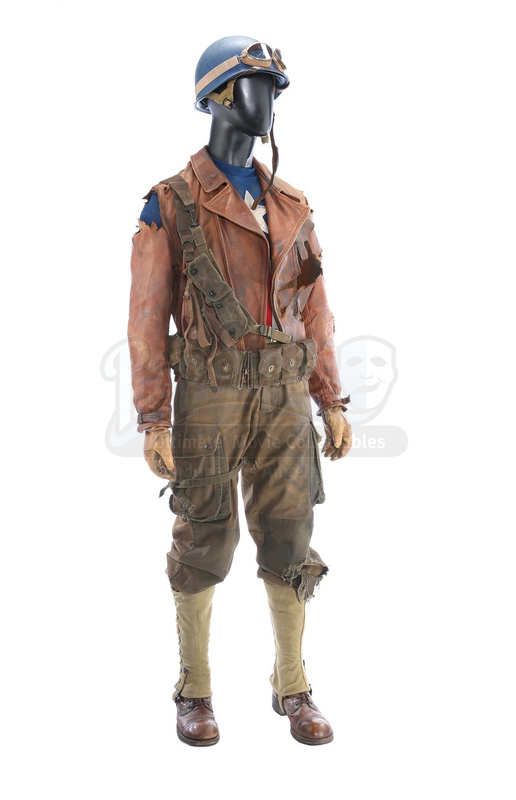 Aside from the noted wear, the complete costume remains in very fine overall condition. Obtained through an official Marvel Studios auction.